Hello all! What fun it’s been to read your posts and course updates. I hope things are going well. 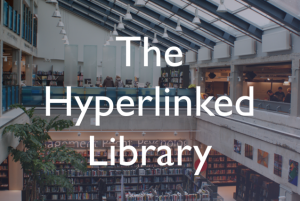 The next module is here – an overview of the Hyperlinked Library Model. Be sure to check your blog for pending comments. Dashboard –> Comments. You may see some that need approval. If you haven’t added a profile pic or avatar, please do so by editing your Profile under the top right hand menu on our site. Remember: you can use any image to represent yourself in class. Feel free to experiment with your blog theme. There are many choices in Dashboard –> Appearance –> Themes. Please change your theme from the default.